I was sceptical about this E- book when I first purchased it, but I have come to love it and I live by it now! 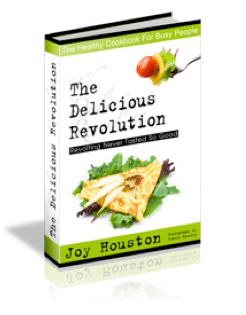 The Delicious Revolution cookbook is a great E-book if you are interested in healthy cooking and healthy living. The author is Joy Houston, with photography by Travis Houston. This book has so many delicious recipes, and photography that makes everything look so tasty. This eBook is in full colour and it is very well written. There is so much great information provided in addition to the recipes, which is the main focus of this eBook. The author even includes a list of ingredients, which is a must for healthy cooking, and gives you links to where you can buy them. There are recipes for breakfast, small plates & sides, salads, Entrees, desserts, and drinks. To be honest I have never really been the cooking type as I have always been to busy and I’ve never really had the time which resulted in me eating a lot of ready-meals being a single man and not having to think about my family’s health. I began to realise this kind of eating was costing me a fortune and wasn’t doing too much for my health either! I decided I needed to start cooking my meals from scratch instead of just shoving a ready-meal into the microwave. I still did not have much time on my hands as I usually leave the house at 7am and get back around 7pm due to my busy work schedule. I asked a few friends’ and had a look on-line for some quick and healthy ideas and this book came out top! It really has helped me not only feel healthier but lose a few pounds as-well. It has encouraged me to lead a healthier life and this is why I have put it on my new Blog which I will hopefully have time to add to each week. I highly recommend this E- cookbook to anyone in the same situation as me! I will be adding more soon, keep well, keep healthy and come back soon for more recommendations! Hi Liam, thanks for following my blog! I’m also a single guy and often run into the same problem. I’ve found that often the best solutions is to cook a lot of food when you do have time and then eat the left overs over the next few days. I eat mostly vegetarian and find this works really well with beans I make in a pressure cooker. I’ll have to check out this book! Learning to eat healthy is a awesome goal. Fast, fast, faster, is often confused with better. Cooking healthy is a big step. Keep encouraging others. Thanks for stopping by and taking the time to follow Ivegotconvidence! My prayer is that it will be a blessing to you as you check in from time to time to read what Jesus has done for me, as well as enjoy other things that I might feel like sharing. Your blog sounds wonderful and looks like there’s much needed information that needs to get out about healthy eating. Lord knows I need that! Keep up the god work, and keep spreading the word that our body needs the best fuel to be the best. Thanks for the follow on my blog. Looking forward to getting great info from your blog. Cheers. Darren. Thanks for stopping by, healthy is definitely the way to go. thanks lots for following my blog!